Strawberries with basil and balsamic vinegar, aka strawberry carpaccio, appeared relatively recently on Paris bistro menus. The combination makes a refreshing dessert on warm summer evenings — light, tangy and sophisticated. And the real magic is that it takes about five minutes to prepare. You can also vary the ingredients, adding a few raspberries or replacing the basil with mint. Don’t tell your guests about the balsamic — let them guess. When thinking about this dish, I got to wondering about the name carpaccio. It is obviously borrowed from the Italian dish of thinly sliced raw beef, sprinkled with olive oil and lemon juice and often topped with arugula or basil. But how did that dish get its name? I did a little research, and the answer made me nostalgic for a romantic trip to Venice I enjoyed many years ago in the company of an Argentinian friend. During our visit — a few days before Carnival, when Venetians stroll around in masks and vapor rises spookily from the canals — we went for cocktails one afternoon to a historic venue, Harry’s Bar. Hemingway used to hang out there, as did Charlie Chaplin and Orson Welles. It turns out that the owner, Giuseppe Cipriani, created the beef dish in 1950 for a countess who had been told by her doctor to eat raw meat. As the dish was red, he named it after the Renaissance painter Vittore Carpaccio, who used a lot of red in his paintings. Okay, that’s the lore. In fact that dish already existed, in the Piedmont region on the other side of northern Italy, where it was known as carne cruda all’Albese — raw meat in the style of Alba, a Piedmont town south of Asti, famous for Asti Spumante, the Italian sparkling wine. The Alba region itself in fact produces some great wines, among them Barolo and Barbera. But we’re getting off subject here. As food lovers will know, the term carpaccio has since been broadened to include practically anything raw and thinly sliced, from salmon, tuna or sea scallops to mushrooms, fresh figs and, yes, strawberries. Given the origin of the term, I like the fact that strawberry carpaccio includes a touch of Italy with the balsamic. Whoever first dreamed up the idea, and this I didn’t discover, it’s a great invention. Give it a try. Oh, and one more thing. Nearly forgot to mention that The Everyday French Chef has been named one of the 12 best blogs about France. Very delighted about this! Also on the list is one of my favorite food blogs, Chez Loulou, by an American who set out to taste as many French cheeses as she could. Her list now stands at 223 cheeses — worth checking out. 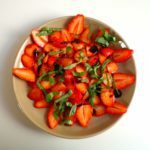 This entry was posted in Desserts and tagged balsamic vinegar, basil, carpaccio, Harry's Bar, recette, recipe, strawberries. Bookmark the permalink. Congratulations Meg on your inclusion in the list. Well deserved. Strawberries in balsamic first became popular in Australia a few years ago before we moved to France. It ‘s a fascinating combination and yes, delicious. Keep up the good work. Wonderful Meg, I’m delighted too!